Italo Calvino was an Italian writer associated with both neorealism and postmodernism. He published a number of works during the latter half of the twentieth century and won a number of awards including the World Fantasy Award for lifetime achievement. First published in Italian in 1972, with William Weaver’s English translation appearing in 1974, Invisible Cities numbers among his later works. Invisible Cities is a collection of imaginative renderings of various cities, which also operate as meditations on things like reality, truth, language, perspective, communication, and the myriad ways we experience the world. All this is framed within a simple dialogue between two characters: Kublai Khan and Marco Polo. These characters are of course based on real people, and a real relationship. Marco Polo was an Italian merchant traveller who lived during the late 13th/early 14th Century, and Kublai Khan was a mogul emperor, the grandson of Genghis Khan, and the founder of the Yuan dynasty following his conquest of China. But their characterisations and the characterisation of Khan’s empire are used more for their mythology and the history of fictions that have sprung up around them, than for any historical grounding. There is a rich literary tradition following from The Travels of Marco Polo themselves, which were written down by romance writer Rustichello da Pisa, who was imprisoned with Polo in Genoa. These writings followed Polo’s own oral accounts of his travels through Asia between 1276 and 1291, and his time in Khan’s court. This travelogue has sparked many other literary projects, such as the famous poem ‘Kubla Khan’ by Samuel Taylor Coleridge, Kafka’s The Emperor’s Message, and of course Calvino’s Invisible Cities. In Invisible Cities, Calvino relies upon the fabulousness of Polo’s tales, and the literary heritage they engendered, to question the reality not just of the cities he is describing, but also the reality of the framing dialogue. The cities themselves are incredible; from a city made up of spiders’ webs suspended over an abyss, to cities that model themselves on the patterns of the stars above. From the start, we are sure that these are cities of the imagination, dream cities, impossible cities, invisible cities; they are not real, and they are not presented as real within the book. But what of Khan and Polo? At the beginning at least, we are asked to suspend our disbelief for the duration of the dialogues; the stories, or the fictions, are in the cities, not in the developing scenario between the characters. But it is not long before this situation breaks down, and we begin to question Khan and Polo, as they, in fact, begin to question themselves. Are they really there, talking together in the luxury of the palace: the emperor and the traveller from a distant land? Or are they just two homeless beggars, telling made up stories as they pick through the city’s rubbish? The potential absurdity of this situation clearly invokes writers like Samuel Beckett, whose play Waiting for Godot is centred around two homeless vagabonds who play language games to pass the time as they wait, seemingly endlessly, pointlessly, and repetitively for a character named Godot. This is one of a number of examples of intertextuality within this book, foremost among those being The Travels of Marco Polo, which has some interesting correlations with Calvino’s text, particularly in relation to the style of the narration. This phenomenon is described in one of Umberto Eco’s most well-known essays, ‘Travels in Hyperreality’ which is the first essay in his collection Faith in Fakes. In this essay, he describes the postmodern society as one where the idea of the original has become irrelevant, where we are happy with copies and reproductions, and where we immortalise the fake in museums, through things like waxworks and dioramas. As these more recognisably contemporary elements seep into Polo’s descriptions, the cities don’t feel quite so imaginary, or quite so distant anymore. The question arises, were they ever imaginary at all? Or do all the cities have something to tell us about the world we live in? Are they different cities, one city, or all cities? These questions are raised both between Khan and Polo who discuss the possibility of an archetypal or “ideal” city to use Plato’s conception, from which all others are derived, and within the cities themselves, as they cross over each other; the same cities appearing with different names, changing as we see them from different perspectives. 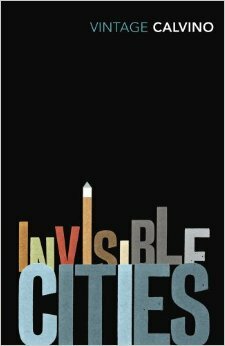 In this respect, we can see Invisible Cities as a truly multi-faceted text. Just as each city offers a slightly different perspective, or the same perspective reimagined, so the book as a whole has many sides. To draw a single conclusion on what it is about, or what the truth or the moral at the heart of it is, would be a flawed exercise from the outset. The beauty of Calvino’s book is in the way it changes in different lights to reflect different aspects of the cities we build.